GI motility is the movements of the digestive system. The controlling power of this motility is the responsibility of neurotransmitters that signals the movements of each and every part of the gastrointestinal system. There also are specific nerves connected there for this purpose. The MotilPro Pure Encapsulations promote the gastrointestinal motility by promoting the neurotransmitters serotonin and acetylcholine. Pyridoxal 5’ phosphate is the activated form of vitamin B and acts as a cofactor in the ultimate serotonin formation process. This cofactor helps with the enzymatic conversion of 5-HTP into serotonin. Ginger root extract can increase the serotonin level in the body. Ginger can act as a serotonin antagonist that prevents the reuptake of this neurotransmitter and regulates its level in the gut. Acetyl-L-carnitine supplies the acetyl groups for the formation of acetylcholine. This neuron is also of the use in the gut signaling to maintain the healthy GI motility. 5-Hydroxytryptophan is the immediate compound that is converted into the neurotransmitter serotonin. This 5-HTP is absorbed by certain cells called enterochromatic in the epithelium of the digestive system. There this 5-HTP is decarboxylated with the help of the cofactor pyridoxal 5 phosphate to be converted into serotonin. The daily dosage of Pure Encapsulations MotilPro is 3-6 capsules. These capsules could be divided equally between the 3 meals of the day. MotilPro Pure Encapsulations should not be used by pregnant women and lactating women. As for the side effects, sensitive people might have skin rashes, gastrointestinal upset after taking the MotilPro capsules. Otherwise, it is generally safe to be used by adults. The drug interactions of MotilPro include with that of the selective serotonin reuptake inhibitor drugs. The presence e of ginger root can also interfere with blood thinning medications. 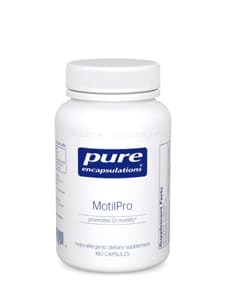 The MotilPro capsules from Pure Encapsulations promote the gastrointestinal motility by promoting the neurotransmitters serotonin and acetylcholine. The MotilPro reviews show that the capsules are rather strong with the presence of ginger in it. Many suggest you taking plenty of water to calm the ginger. It is also suggested that you take cold water or water in the room temperature to avoid the capsules breaking open with warm or hot water. Samantha has used MotilPro Pure Encapsulations to prevent the recurrence of SIBO. She got relief big time and has not suffered any side effects. The only discomfort she had was the ginger burn that was relieved by drinking plenty of water. Marie has been successful with MotilPro with the problem that she needs to find the right dose for each day to have it right. She takes it regularly and drinks plenty of water to calm the ginger burn. Her only worry is the inconsistent results. Interestingly, another user had improvement in the mood and sleep rather than the gut motility with the help of MotilPro. Since this is a formula that enhanced the production of serotonin, one cannot find fault in this action. On the other hand, there are users who failed to get any positive results with MotilPro and end up having various kinds of gastrointestinal discomforts in the form of nausea, vomiting, stomach pain etc. In fact, the neurotransmitters formation in the gut happens there itself and the MotilPro supplies the necessary ingredients for their synthesis. It is made hypoallergenic that contains only vegetarian ingredients. It stimulates the signaling neurons of the gut and thereby improves the gut motility. SIBO or the Small Intestine Bacterial Overgrowth can lead to leaky gut. One of the treatment methods for SIBO is to correct the motility issues in the intestine. Taking MotilPro can help in this task along with the other needed medications. Usually, there is no problem in taking MotilPro with antibiotics and the drugs related to correct SIBO so MotilPro is a safe option to improve the condition. But a doctor’s recommendation is needed before starting with this. First of all, MotilPro is capsules and Iberogast is a liquid remedy. While both of these are a remedy for gut motility, MotilPro is more into the chemical constitution rather than being the external reliever. MotilPro works on the neurons to bring relief while the Iberogast is used for gut motility, heartburn and other digestive discomforts like irritable bowel syndrome. MotilPro works on the root cause of the motility issue and the Iberogast is better dealing with the problem at hand. Where to buy MotilPro from? MotilPro Amazon: Amazon and the other popular online stores are the immediate centers from where you can purchase MotilPro at a cheaper price also. MotilPro is also available in different countries like Canada, UK, New Zealand etc.